Want to know the difference between rimfire vs centerfire? Rimfire and centerfire are two categories of primer ignition systems for ammunition cartridges. The firing pin in rimfire guns strikes the rim of the cartridge base to ignite a primer while in centerfire the firing pin strikes a center primer. Not understanding that 100%? We’ll walk you through it in detail. First…how does a bullet work? 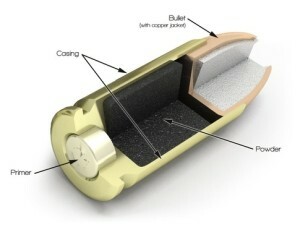 A standard cartridge, or round, consists of four parts—the bullet, propellant, primer, and a case. Keep in mind that a “bullet” means just the projectile, not the entire cartridge. These components are all present regardless if a round is a rimfire or centerfire. In the grand scheme of things, all bullets work the same…the firing pin of the gun hits the primer which creates a tiny explosion. That tiny explosion sets off the gunpowder which forces the bullet itself forward and out of your gun through the barrel. More on how a gun works. The difference between the rimfire and the centerfire is in where that primer is located. The easiest way to tell them apart is to see if you can see a circular primer in the center at the base of the casing. The primer in the center = centerfire! If you see a smaller cartridge with no overt primer, it is likely rimfire. You can see that the names really make sense when you look at the ignition systems. 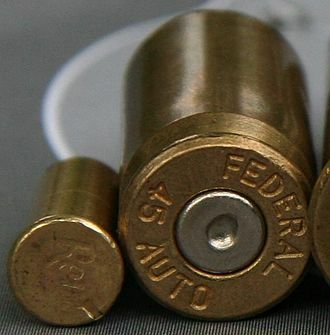 Rimfire ammo gets its name from the firing pin striking the “rim” of the cartridge to ignite the primer. While centerfire ammo is where the firing pin strikes the primer that is located at the “center” of the cartridge base. You can see the firing pin marks on the spent brass above. Again, centerfires hit the center primer while rimfires hit the rim. Rimfire ammo is limited to smaller calibers since the cartridge walls need to be thin enough to be able to be crushed by the firing pin and ignite the primer. Well, the nature of the casing means it’s pretty much limited to small calibers. You have to have some relatively flimsy brass to handle the rimfire set up. As a result, the powder necessary to propel a larger bullet would blow the brass apart. The most common type is the .22LR (long rifle). Check out our Best .22 LR Ammo for Accuracy, Plinking & Hunting guide. .22 Long Rifle (LR): Most popular round in the world and the starting point for many shooters. .22 WMR: Winchester Magnum Rimfire. Used to hunt vermin and is between the .22LR and the .223 centerfire round. .17 HM2: Hornady Mach 2: Higher power than the .22LR but smaller. Didn’t really take off. The smaller brother of the HMR. 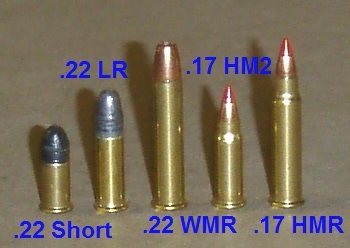 .22LR can be found for 5-10 cents while the AR-15 .223 round is between 25-40 cents each. It is so cheap since it is easier to manufacture a thin-walled case with a flattened primer at the bottom. Well, the nature of the casing means it’s pretty much limited to small calibers. You have to have some relatively flimsy brass to handle the rimfire set up. 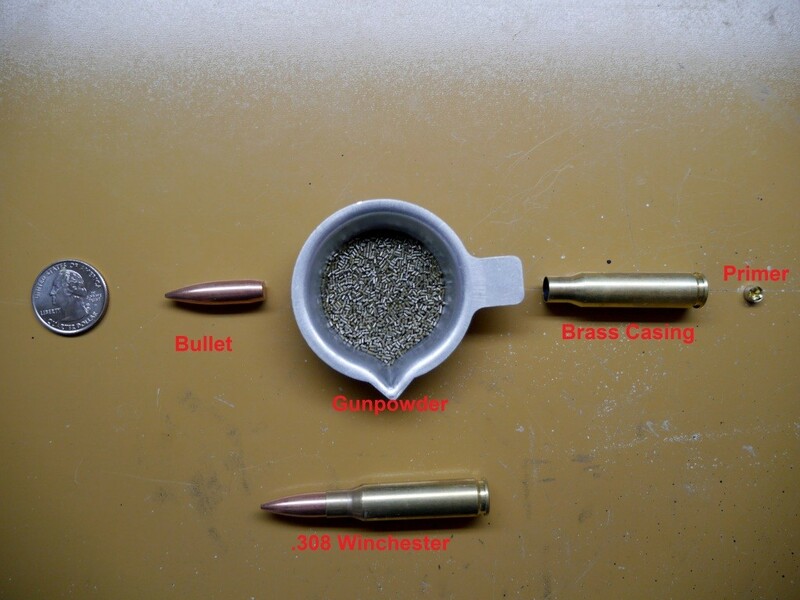 As a result, the powder necessary to propel a larger bullet would blow the brass apart. However, there has been some hoarding in the last few years which makes it a little difficult to find in stores and online. The .17 and .22 caliber bullets and a small amount of gunpowder make for extremely low recoiling firearms. Perfect for the beginner or for training. The primer is inside the bottom of the case and so cannot be reloaded like centerfire rounds. But rimfire ammo is so cheap comparatively that it doesn’t matter. Even with top shelf ammo like CCI, I still manage to get 1-2% failures to fire (FTF) in my 10/22 rifle. This is because, in manufacturing, the primer compound is “spun” at the bottom of the casing and sometimes does not make full contact with the entire rim. Rimfire is great for range plinking and varmint hunting, but I would not trust it for personal defense. Again, because of its design, rimfire is stuck with small calibers. There are some exotic larger caliber rimfires out there but they are very rare. Looking for some centerfire or rimfire ammo? Check out our Best .22 LR Ammo for Accuracy, Plinking & Hunting…or our exhaustive Ammo & Reloading guides. What do you like best, centerfire or rimfire? Let us know in the comments! So you said the pros and cons of rimfire, but not center-fire, at least not that I seen using my phone. Hello Eric, I have a few questions as well. You say rimfire is tipically for low caliber, but what about for example the 7.62x54R for szvd? That is not a small caliber (in my opinion), and pretty powerfull ammo. My second question is, is there any advantage/disadvantage in bolt mechanism between rimfire and centerfire types? Hi Sandor, you might be confusing rimfire (describes the primer) and rimmed (describes the casing). As far as I know, the 7.62x54R is a centerfire rimmed cartridge. Bolt will have less problems with a wider variety of ammo since some rimfire doesn’t have the power to cycle semi’s. Hello Eric, just came across your nice website. I must add that I would never waste money on rim fire ammo. It’s like trying to buy wet matches in a bathtub full of wankers. OK, I’m an old lady but I do like to target shoot. I just bought a .22 that is a rimfire. 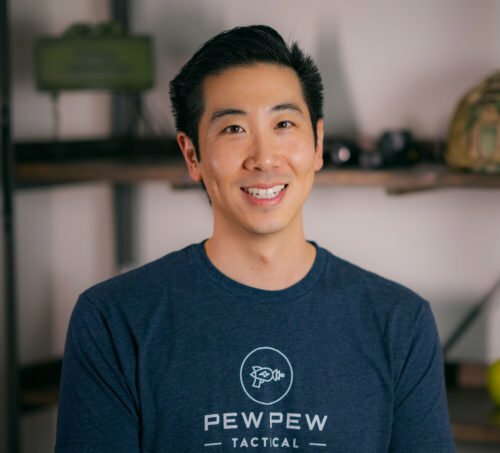 What happens if I accidentally use centerfire bullets in the rifle? They probably won’t fit…but it wouldn’t be good. Highly advise against using any ammo that is not for the specific firearm/barrel. I just bought yesterday 8/22/17 a 9 mm hand gun. The salesman sold me 9 mm centerfire bullets. My gun after I got home and read the manual is centerfire. Should I return the ammo? Hi Doug, I’d bring it back if you have any doubts. If he’s bought a centerfire gun and been sold centerfire rounds, yet is asking if he should return the ammo, I’d suggest that he’s too stupid to own a gun. This is just a small part of everything that is wrong with America. Do you understand what Doug Timmons is asking? He bought centerfire handgun and sales man sold him centerfire ammo. That is correct, why should he return it? You should understand about guns and ammos better Eric. …yeah. I think that if the guy has any doubts he should talk face to face with someone about those doubts and clear up the issue. And this is best accomplished by bringing it back if he has any doubts. Some random guy on the internet can’t confirm anything about the gun or ammo without a lengthy discourse. Faster and simpler to go talk to someone nearby.